Do you remember that one? Click here to see some sweet vintage pictures of Daffy-down-dilly as they appeared in nursery rhyme books. 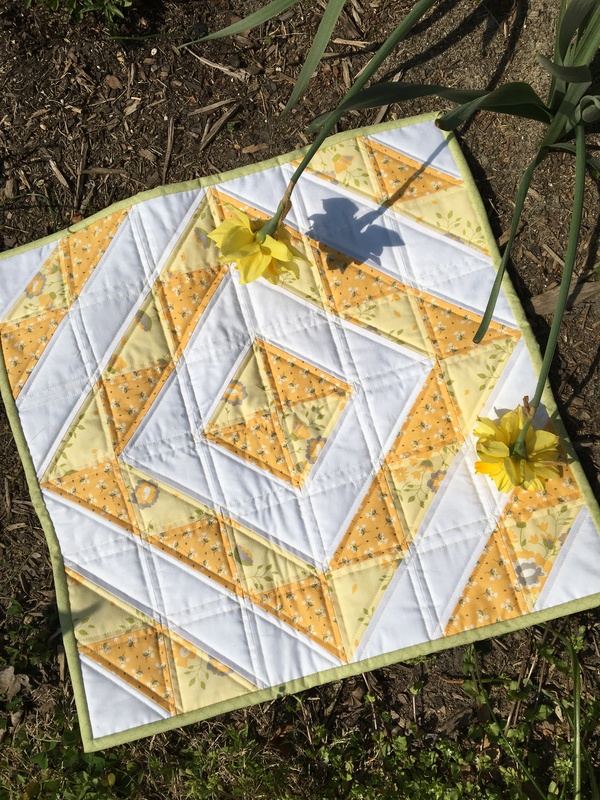 The arrival of spring and the blooming of daffodils inspired me to make a cheery yellow and white table topper from “Pepper & Flax” fabrics designed by Corey Yoder for Moda. If you would like to make one, too, you’ll need 1/8 yd. each of two different shades of yellow, 1/4 yd. of white fabric, and 3 green strips (2 1/4″ x 40″) for binding. From each of the two yellow fabrics, cut nine 4 1/4″ squares; from the white fabric, cut eighteen 4 1/4″ squares. Granted, 4 1/4″ is an unusual size, but it’s calculated for efficient fabric use in making a table topper size quilt. Draw a diagonal line on the wrong side of each white square. Pair the white squares, right sides together, with yellow squares. Sew 1/4″ away from both sides of the drawn line on each pair. Cut apart on the drawn lines. Each pair of squares yields two half square triangles (HSTs). Select the HSTs made with the darker yellow fabric and press the seams toward the yellow triangles. Then select the HSTs made with the lighter yellow fabric and press the seams toward the white triangles. I did not “square up” or trim my HSTs since they were all the same size (3 7/8″), but you could do so. Lay out the HSTs as per the photo. Sew HSTs together to make six rows. Press seams open. Pin the rows together. By using sharp, thin pins and leaving them in place as I sewed, the seams remained aligned. Please do not tell the quilt police that I sewed over pins. Sew and press seams open. The quilt is 20 3/4″ square. Quilt the project: I quilted 1/4″ away from both sides of all seam lines. Bind with green fabric. I cut the binding strips 2 1/4″ wide, joined them with diagonal seams, pressed the strip in half width-wise, and sewed the binding to the quilt with a 1/4″ presser foot. 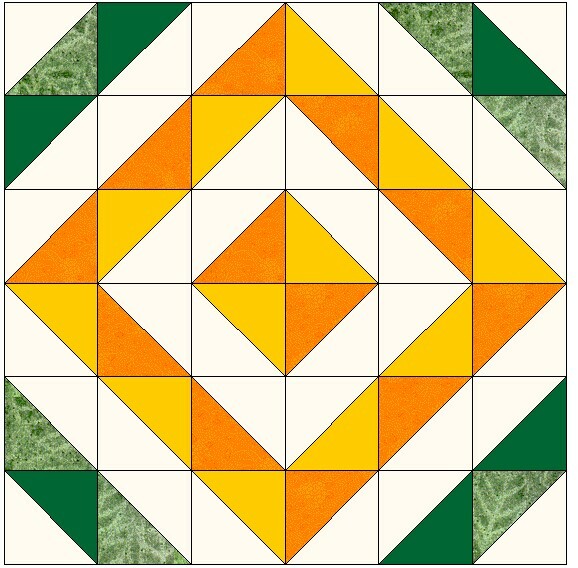 Of course, once I made the table topper, I began thinking “what if?” What if I substituted two shades of green in the rows of three triangles near the corners? 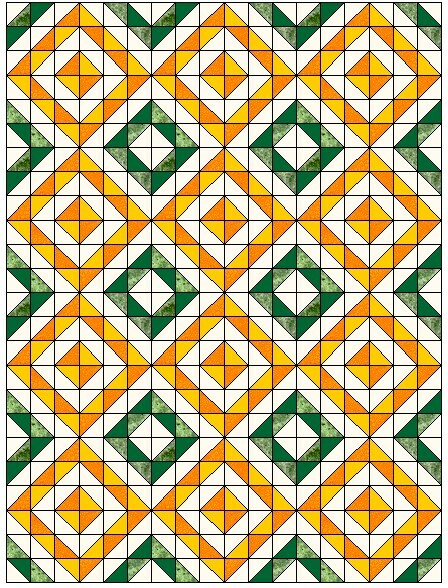 With Electric Quilt software, it’s easy to draw and color my design imaginings. 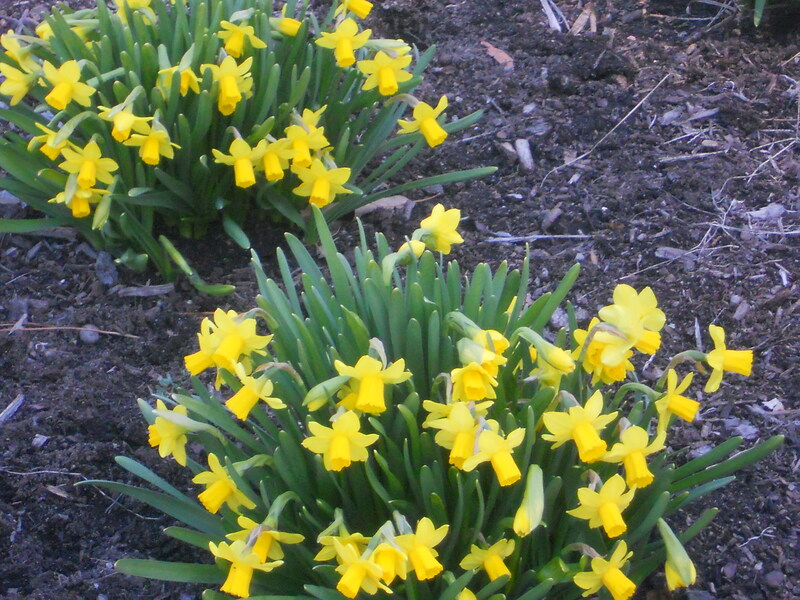 What a beautiful daffodil quilt this would be! If you made a table topper like this from HSTs, would you use yellow or some other color combination? Love the spring table topper! I plan to use some of my yellows to make one. Thanks so much Aby. Thank you, Janeanne. I would love to see a picture of your table topper when you complete it! I love the look of the full size quilt. Looks like a quilt appropriate for the boys in my life!! I think this pattern would look great in red, white, and blue as well. this is wonderful. thank you for the instructions. Thanks, Lori. If you make a table topper, please send me a picture of it. loved the nursery ryme pitcures. Love daffodils and your spring table topper. I like the green options! Thank you. The daffodil inspired topper looks right at home on my kitchen table. I display it diagonally (or, on point). With 14+ Electric Quilt software choices on Amazon, which one would be best for a beginner? I have a 6 year old Bernina machine and a move, aging Mother and other factors I haven’t made a quilt recent. I currently use EQ5, but it is my goal to order EQ8 this year and take the time to master the updates. Thanks, Karla. Please send me a picture of your table topper made in brown and green when you finish it. Very cute design, so clean and uncluttered. I love blue and yellow designs. No that will not match Mother Nature, but will sure try this.